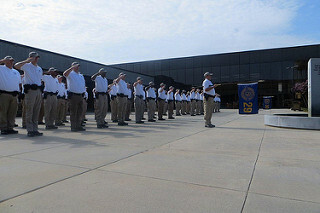 The Basic Training Division at GPSTC conducts Georgia’s basic, state-mandated training for two types of officers: law enforcement officers and jail officers, both of which require Georgia Peace Officer Standards and Training (POST) certification. Basic training for firefighters is conducted through GPSTC’s Georgia Fire Academy. In addition to the main campus in Forsyth, the Basic Training Division operates several regional academies located strategically around the state. These regional academies conduct basic law enforcement training and basic jail officer training as well as some selected advanced and specialized law enforcement training. Candidates interested in becoming a police officer or jail officer may attend the basic training academy of their choice. Candidates who are interested in becoming a firefighter must attend training at the Forsyth campus and should visit Georgia Fire Academy’s Basic Firefighter Training Program web page for more information.